The history of the Regiment is, as already mentioned, a long and illustrious one. We as a re-enactment group primarily focus on one area of its history (Normandy 1944). Because of this we have not gone into great depth into the Regiments past history. 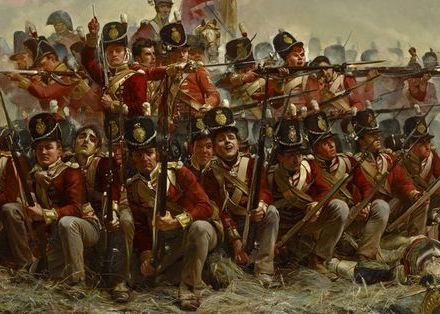 This is not because we feel it is unimportant, but simply that we could easily fill an entire website with the story of the Regiment through the ages. Therefore we give you an overview of its past here. If you wish to know more about a certain period please check our 'Acknowledgements' section for our list of sources or feel free to contact us via the details provided in the 'Contact Us' section. The Regiment can trace its heritage to Holland during the 17th century. In 1674, during the Anglo-Dutch Wars, the British government ordered two Regiments of English troops, Two of Scots and one of Irish to remain in Holland (believed to be at Breda following a peace treaty signed there). In 1685, when James II requested their services in England during Monmouth's rebellion, the Regiments were organised into two units, and given its first designations, 5th and 6th Regiments of Foot. Colours have origins dating back to Ancient Eygptian times, but did not arrive into European military fields until around the 11th century. Originally colours would have been a rallying point for a Regiments men, and a means of unit identification to an armys generals, with the first colours carried in battle displaying the Regimental commanders coats of arms. By the 1700's colours had become Regimentally specific for the British Army, and 'The Honour of Namur' was one of the First Battle honours ever added to a Regiments colours. The Namur Battle Honour however would not be added to the Warwicks colours until 1910, never the less, it would be the first, among many the Regiment was to earn through its long service. During the War of Spanish Succession the 6th was in Spain and Portugal fighting the armies of Spain and France. 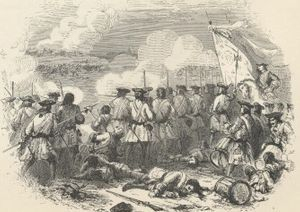 The Regiment fought at Barcelona in 1706 and suffered heavy casualties at Almanza in 1707. In 1710 the 6th played a major part in the victory of Aimenara and won undying fame at Saragossa and Brihuega. 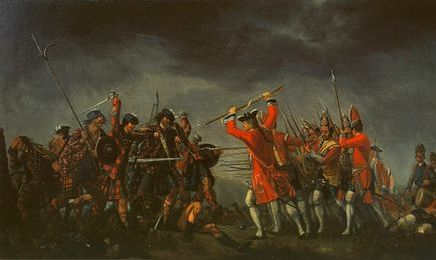 The Regiment's next conflict was the Jacobite Rebellion of 1745. The 6th was sent to secure the Highland forts between Inverness and Fort William. Two companies were with the ill-fated army under General Cope at Prestonpans, where they were among the few who stood their ground. The 6th also defended Fort William, beating off every attack as all the other highland forts surrendered. The Regiment went to Gibraltar in 1753 before moving on to the West Indies on garrison duty. At the outbreak of the American War of Independence, detachments from the 6th arrived in New York in 1776 and saw action, but were of insufficient strength due to high levels of disease and were sent home. In 1782, as an aid to recruiting, territorial links of infantry regiments were established, from this the 6th became the 1st Warwickshire Regiment. During the French Revolutionary wars in 1794 in the West Indies, the 6th took part in the capture of Martinique, Guadeloupe and St Lucia from the French and in Casdebar in August 1798 they gained a Battle Honour. The 1st Battalion went from Gibraltar to the Iberian Peninsular and was at Rolica and Vimeira in 1808. The Battalion then took part in the retreat to Corunna, losing 300 men during the march. The men were then shipped back to England before taking part in the Walcheren expedition before returning to the Peninsula in 1812. The Battalion was present at Vittoha 1813 and heavily engaged at the later action at Roncesvalles. At the Heights of Echalar in August 1813 Wellington watched the Regiment's attack against 6,000 French in rugged positions in the mountains and described it as "The most gallant and the finest thing he had ever witnessed". They were held in reserve at the Nive and were again heavily engaged at Orthes 1814. Once again, this so impressed the Duke that he subsequently scratched on the officers' mess silver snuff box, which since 1785 had borne the words "Seek Glory", the additional words "Huzza for the 6th Regiment Now Keep Glory". In 1832 the 6th became a Royal Regiment and their title was changed to 'The Royal (1st) Warwickshire Regiment'. 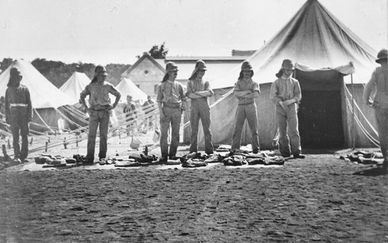 The Regiment took part in the 7th and 8th Kaffir Wars in South Africa and received the Battle Honour South Africa 1846-7, 1851-2-3. Service on the North West Frontier took place between 1849 and 1868. 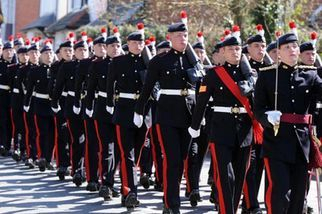 The Regimental Depot was established at Warwick in 1873 and, following the 1880-1881 Cardwell Reforms, the Regimental title became 'The Royal Warwickshire Regiment'. In 1898 the Regiment fought at Atbara and Omdurman during Kitchener’s reconquest of the Sudan and saw service in the Boer War 1899-1902 at Johannesburg and Diamond Hill. 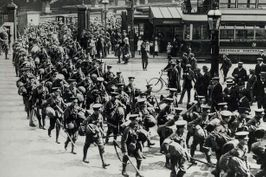 During the First World War the Regiment raised 30 battalions and gained 80 Battle Honours. During 1914 Battalions of the Warwicks were present at Le Cateau, the Retreat from Mons, Nery, the Marne, the Aisne, Armentieres, Ypres, Langemarck, Gheluvelt and Neuve Chapelle. The following year opened with 2nd Ypres followed by St julien, Frezenberg, Aubers, Festubert, Bellwarde and Loos. During 1916 battalions were at Mount Sorrel, the Somme, Albert Canal, Bazentin, Delville Wood and a number of other engagements including Thiepval. 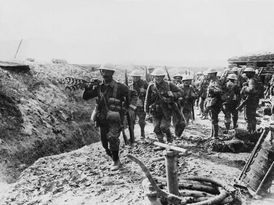 The big battles of 1917 saw battalions in action at Arras, Vimy, 3rd Ypres, Menin Road, Passchendaele and Cambrai. 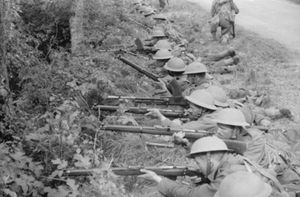 The Somme, Amas, Lys and the Hindenburg Line were among numerous actions which involved the 6th in 1918. 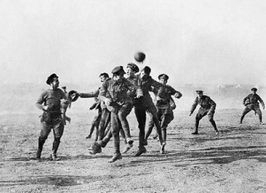 In addition to the Western Front, battalions of the 6th also saw action in Italy 1917-1918, at Gallipoli 1915-1916, Mesopotamia 1916-1917 and Persia 1916-1919. The 6th won six Victoria Crosses during the First World War. The 2nd, Battalion (upon which we focus for our impression) was part of the BEF in France and Belgium. On the 27th May 1940 near the town of Wormhoudt the SS attacked and by 4.00pm had overrun the position. About 70 2nd Warwicks prisoners were herded into a barn The SS threw in grenades and opened fire with machine guns, The survivors of the massacre (15) were taken prisoner later by the regular German army. The culprits were never brought to trial and their victims are buried in Wormhoudt Cemetery. 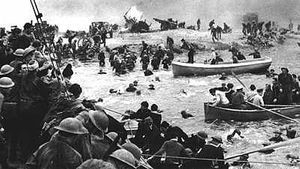 The Battalion continued to serve in France ( one such action being that at Ypres-Comines Canal) before being given the task of keeping open the main supply route to Dunkirk prior to their own evacuation from the continent. Back in 'Blighty' the Battalion was reorganised, re-equipped and transferred to 185 Brigade as part of the British 3rd Infantry Division. From then until June 1944 the unit underwent heavy training and recruitment, ready to return to France for Operation Overlord and the invasion of Normandy. 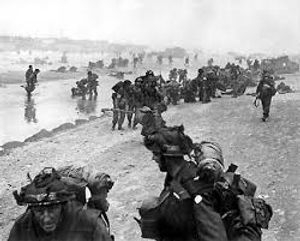 The 2nd Battalion landed on Queen beach, a sub-division of Sword, on 6th June 1944. and took part in the fighting around Caen On the 7th June they fought for Lebisey Wood. suffering many casualties. German infantry and tanks had moved into position in depth overnight With radio communication problems, no heavy artillery support and with the armoured carriers and anti tank guns already knocked out, these brave men fought on at close range, after coming under intense fire as they crossed a corn field in open order. That night they had to withdraw. This part of the 2nd Battalion's history is our main impression and is covered in more depth in the 'D-Day and Lebisey Wood' section. There were several gallant acts during this period, For example, B company as losing men to a German machine- gunner firing from close range from Emieville, the village just beyond Cuillerville wood. Corporal W.J.Millard crawled toward the enemy Spandau with his Bren gun, then got up and rushed it,firing from the hip. He killed two of the enemy, only to be mortally wounded himself. 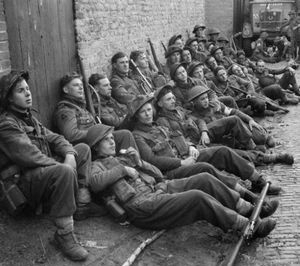 The Battalion fought on into Germany via Holland until the War eventually ended. Monty said of them "No better soldiers" They had upheld the high traditions of the Regiment gained over many centuries. upholding their proud motto "Seek Glory"
Battle Honours 1939-45: Defence of Escaut; Wormhoudt; Ypres-Comines Canal; Normandy Landing; Caen; Mont Pinçon; Venraij; Bremen; North-West Europe 1940, 1944-5; Burma 1945. Bourguébus Ridge; Falaise; Rhineland; Lingen; Brinkum. Between 1945 and 1947, the 1st Battalion was deployed to India, then Korea between 1953 and 1954. 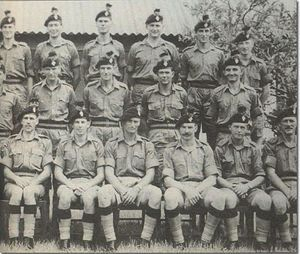 Between 1955 and 1959 the Battalion was stationed in Cyprus before being moved to Aden 1959 until 1960 before being moved to Germany in 1962 through to 1964. Meanwhile, the 2nd Battalion was in Palestine from 1945 to 1948. In 1958, the depot in Warwick was closed and the regiment was reduced to a single regular battalion, sharing a depot in Strensall with the three other regiments of the Midland Brigade (renamed the Forester Brigade in 1958). In November 1962, it was announced that the Forester Brigade was to be broken up and the Royal Warwickshire Regiment was promptly transferred to the Fusilier Brigade.In February of the following year, it was announced that the Queen had approved that the Regiment was to become fusiliers and adopting the title of Royal Warwickshire Fusiliers from 1 May 1963. As a fusilier regiment, the Royal Warwicks were entitled to wear a coloured feather hackle in the headdress. The colours chosen by the regiment were royal blue over orange (described as "old gold with a touch of Dutch pink"). The colours were those of the Royal House of Nassau, recalling the regiment's Dutch origins.On 23 April 1968, the four regiments of the Fusilier Brigade were amalgamated to become a large regiment as the Royal Regiment of Fusiliers.